We, the Missionary Sisters of the Precious Blood, are called to live the Paschal Mystery and to witness to the redeeming love of Christ. Our Father Founder stated, “You are meant for the missions.” We dedicate ourselves primarily to the task of evangelization among those peoples and nations who do not know Christ and his gospel. We also minister in areas where the local Church is not viable. We journey with all people knowing that God is already present in every culture and religion. 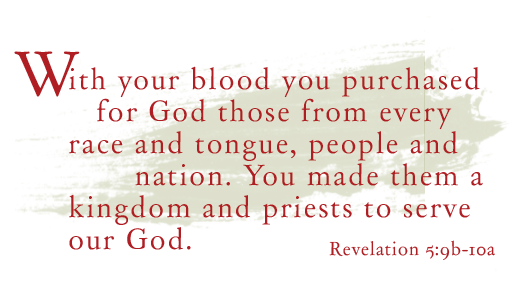 The goal of our missionary service is to bring the good news that God became flesh in Jesus who redeemed the whole world with his Precious Blood. We offer our pastoral and social services to all people irrespective of religion, race, nationality or social standing. Interreligious dialogue is an essential part of our mission. Today the Church is also calling for new evangelization, the rekindling of faith in persons and cultures where it has grown weak or no longer exists. We need to read the signs of the time and discern where God wants us to be and how to be witnesses of the Kingdom. ”As Missionary Sisters of the Precious Blood we are called to live the Paschal Mystery and to witness to the redeeming love of Christ“. Following Christ in religious life is realized in such manifold ways that no single person or congregation will be able to exhaust all aspects. Yet it is helpful and of great use to the Church that each congregation lives her individual charism and her particular ministries. As Missionary Sisters of the Precious Blood we are invited to recognize and to live the Paschal Mystery in our own history, in the circumstances of present-day life, both personal and congregational. And it is the painful moments and events in our lives and in our times that demand special attention. The Paschal Mystery will not give us reasons or explanations for grief and suffering, but it offers help and shows up ways to cope with and live through our painful experiences. Our name is also our mandate: to honour the blood of Christ and to make it fruitful through our apostolate. We honour his blood in celebrating the Holy Eucharist, in meditating upon the Rosary, the Stations of the Cross and other prayers. We know that it is God who makes the blood of Christ fruitful – not we – but it is up to us to prepare and create favourable conditions for its fruitfulness to unfold its healing power. This is what we contribute. “The purpose of our life is to give glory to God in total surrender through our profession.” Our missionary spirit will become visible by courageously committing ourselves to Christ not merely by working in mission countries. It is our attitude that makes us missionaries, not the kind of work we do. This applies to all sisters, whether they live in home or mission countries. St. Theresa of the Child Jesus was a cloistered Carmelite and became a patron saint of the missions. However, “we dedicate ourselves primarily to the task of evangelization among those peoples with whom the church has not yet taken root or is not yet viable without being aided.” We particularly serve “those nations who do not yet believe in Christ, and we assist the growth of the young churches, irrespective of race, creed or social conditions”. This is a significant extension of ministries compared with the early constitutions. In addition to the traditional ministries, the formation of Christian families is made mention of as “a special concern”. 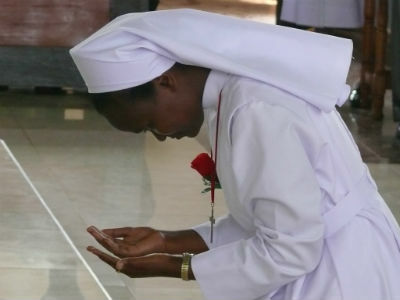 Since the number of sisters engaged in exterior ministries is decreasing for reasons of age and sickness, emphasis is laid on the apostolate of prayer and suffering. The Paschal mystery is at the very heart of our common vocation. It is the key towards understanding life personally and as community. It is strength and promise, shelter and encouragement. The Paschal Mystery reveals itself in our life-story and it all depends on discovering, understanding and living it. In our charism God has entrusted to us a great treasure. It is like a tree offering us delicious fruit; it is like a flowing fountain in the desert to quench the pilgrim’s thirst. This fountain will never be emptied; the riches of our charism will never be exhausted. Each sister will find what she is searching for and each will receive as much as she can take.